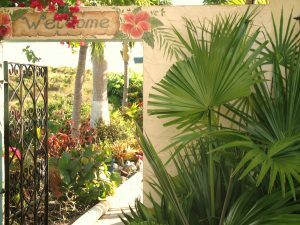 Enter the gate of Carringtons Inn St. Croix your BED AND BREAKFAST. Spectacular views, comfortable setting, cool breezes all combine to create the climate for relaxation. After a tasty breakfast take a dip in the pool, sun on the deck or watch your favorite show on the large screen television. Wi fi internet access, Lap-top computer and printer access, a trading library, beach towels, blow dryers, all available at the Inn. St. Croix is the largest of the United States Virgin Islands, “America’s Paradise”. It is 82 square miles of beauty, charm and diversity. The friendly people will brighten your day. It will be unusual if someone does not say maun’in (good morning) to you. Try sailing, fishing, snorkeling, swimming, tennis, horseback riding, diving the infamous “Wall” or golf on a world-class Robert Trent Jones course. That’s just the beginning! Boat and yacht rentals are available nearby with all types of amenities. Rent a ski boat with a marine stereo installed so you can listen to your favorite music all day on the water. Or perhaps you would prefer to spend a lazy day sun bathing by our beautiful pool. We provide outdoor marine speakers for your listening pleasure. For scuba diving go to www.stcroixscuba.com. See Buck Island with Big Beards Adventure Tours www.bigbeards.com. Anchor Dive Center www.anchordivestcroix.com located in Salt River National Park offers immediate boat access to the best dive sites on St. Croix. For a bit of exploration and adventure, try our eco-exciting activities. Our underwater national park at Buck Island offers a colorful array of sea life. During our rainy season, hiking the rainforest may reward you with a breathtaking waterfall. You can also hike or bike the many trails that traverse the varied landscapes from cactus to stretches of white sandy beaches. Try your lucky hand at the casino, or shop in our duty-free stores. Be sure to catch a show of the Mocko Jumbies (stilt walkers) and broken bottle dancers, while listening to the enchanting sounds of steel pan. Of course, you must visit our unspoiled beaches and relax in the Caribbean waters. Stop by GoToStCroix.com for everything you need to know about St. Croix. Explore St. Croix with Caribbean Adventure Tours www.tourcarib.com. Get a rental car to explore St. Croix JudiofCroix.com. Take off your shoes and be prepared for a wonderful vacation in St. Croix.